Dusty from DNSDiving.com reached out to us for support in getting higher visibility within the scuba diving industry in the Grand Cayman Islands. They had a website built but it did not generate much traffic or conversions and wanted to make sure they were better competing with a lot of the local competitors. Budget was a restraint for DNS Diving, especially in the beginning. They needed to justify every dollar spent on marketing and while they understood the value in organic search engine optimization, they did not necessary have a big budget for it. Combining this with the fact that many of the competition were implementing very aggressive SEO strategies, and we had to make sure we were able to best serve our client. Given the competition and budget constraints, we took the long-term approach. The process started with an initial round of on-page optimizations to capitalize on the low hanging fruit, building overall brand and website authority, and then moving on to acquiring local and industry signals through links and citations. We knew the local organic results were more competitive than the local map results, so we made sure that maps optimization was a big part of the process. Knowing that while we didn't have a large budget, but that the client was committed to success, we were able to plan far into the future to ensure the continues success and return on their investment. 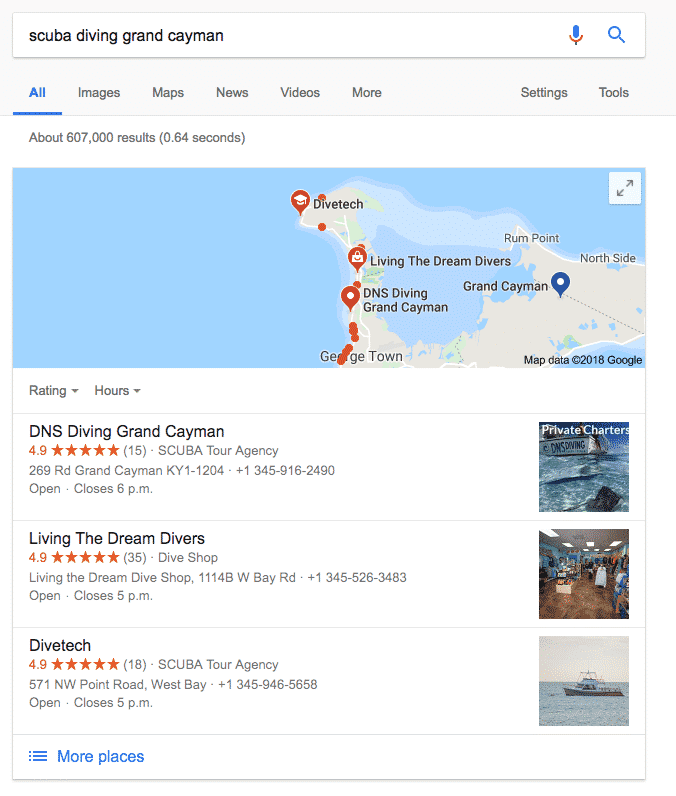 Within the first six months, DNS Diving's website started to appear consistently within the first page of organic search results for many local search terms. And then within the first year, positions within the local maps results were consistent. The campaign continues to expand into new keyword opportunities and sub-niches within the tourism diving industry in Grand Cayman Islands.